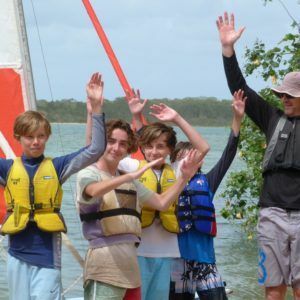 At Sunshine Sailing Australia we encourage kids and young sailors to learn to sail safely, competently and competitively in a fun and friendly environment. Learn to sail better. Learning to sail starts at the basics, moves on to more advanced sailing techniques & then on to racing. 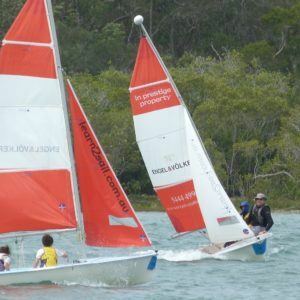 Once a good solid foundation has been achieved with our kids sailing lessons we move on to the more advanced & intensive race clinics in performance dinghies to prepare the young sailor for the competitive but very social weekend club racing. The junior sailor learns how to sail effectively & safely & starts to understand other fundamentals. Without realising, juniors will learn the art of communication, teamwork, & decision making; developing their confidence whilst having fun and meeting new friends in a safe & friendly environment. We supply the training dinghies, life jackets, safety cover, logbook and sunscreen if needed. Each course aims to have a minimum of 12 hours of ‘on the water’ activity. 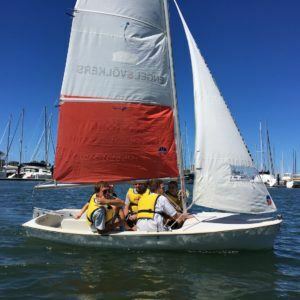 Each session also includes a theory lecture and practical onshore activities including rope work, rigging, sailing techniques, rules of the road, weather and tides, navigation and boat maintenance. 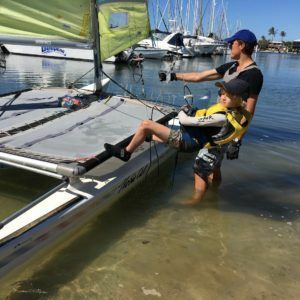 Once these programs are complete, juniors will be ready to sail or race from any sailing club around Australia. 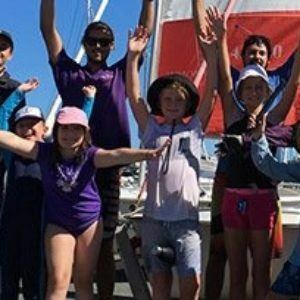 This is a great opportunity for both parents and kids alike to be involved in the sailing scene. We encourage parents to participate & be a part of the sailing clubs in their area to build a strong & worthwhile future for the young sailors of today. Joining in club racing is one of the best ways to enjoy the sport of sailing and make the most of the fantastic social scene after a day on the water.